One way I have been able to profit from the volatility over the past 7 months is by using the option straddle strategy. A straddle is simply buying both the Call and the Put option contracts, and hoping that the stock swings in one direction by more than the cost of both contracts combined. As you'll see from the strategies below, the more volatile the underlying stock the higher the premium, this should make sense, and if it doesn't, this type of trading is most likely not for you. When I use an option straddle, I like to go 30-40 days out until expiration. As we know financials are a very volatile sector therefore they make for good straddle positions. Below are 10 straddle strategies for financial stocks and ETF’s. You’ll most likely need to adjust strike prices and expiration date based on your opinion(s) (Option prices are as of market close May 15, 2009). Strategy 1) Buy American Express (AXP) June 24 call & American Express June 24 put. To implement this strategy would cost roughly $420 and with financials trading +/- 10% on any given day American Express (AXP) above $28.20 or below $19.80 a share in 36 days doesn't seem impossible. AXP would have to change at least +/- 17.5% to profit from this strategy. Strategy 2) Buy Bank of America June 11 call & Bank of America June 11 put. To use this strategy would cost roughly $259 and to break even BAC needs to be above $13.59 or below $8.41 a share at June option expiration. A change of +/- 23.5%. Strategy 3) Buy Bank of NY Mellon (BK) June 27.50 call & Bank of NY Mellon June 27.50 put. To use this strategy would cost $430 per option contract, so BK would have to close above $31.80 or below $23.20. A change of +/- 15.6% by June seems feasible. Strategy 4) Buy Citigroup (C) June 4 call & Citigroup June 4 put. This would cost roughly $128 to use and would pay off if Citigroup closed at or above $5.28 or below $2.72 a share (a more bullish person on C would want to straddle the $2.50 strike). Strategy 5) Buy Goldman Sachs (GS) June 135 call & Goldman Sachs June 135 put. To open this position would cost roughly $1,500. GS would need to trade above $150 a share or below $120 a share to make money from this position at time of expiration. Strategy 6) Buy JP Morgan (JPM) June 35 Call & JP Morgan June 35 put. To open this position would cost roughly $520 and in order to break even JPM would need to close at or above 40.20 a share or at or below 29.80 a share at the time of June expiration. Strategy 7) Buy Morgan Stanley (MS) June 26 call & Morgan Stanley June 26 put. This would cost roughly $420 to use and would pay off if MS closed at or above $30.20 or below $21.80 a share (a more bearish person on MS would possibly want to straddle the $27 strike). Strategy 8) Buy Wells Fargo (WFC) June 25 call & Wells Fargo June 25 put. To open this position would cost roughly $450. WFC would need to trade above $29.50 a share or below $20.50 a share to make money from this position at time of expiration. Although I do not like trading leveraged ETF’s the here are two examples of opening a straddle position on the SKF (Ultrashort Financials) and FAS (Direxion 3X Financials). Strategy 9) Buy SKF June 48 call & SKF June 48 put. This strategy would cost $1700 to open, and in order to profit from it the SDS would need to close +/- 35.4% the strike price by June expiration. Strategy 10) Buy FAS June 9 call & FAS June 9 put. This strategy would cost $300 to open, and in order to profit from it the FAS would need to close +/- 33.3% the strike price by June expiration. ***USE CAUTION*** Please note that these straddle plays could be just as worthless as the paper they're written on, if any given stock doesn't move as much as needed it will surely lose money. The worst case scenario would be if the underlying asset closes on the expiration day exactly at the strike price- 100% would be lost. It is important to monitor a straddle position and I have found trading out of the position before expiration has been to my benefit. To learn more more about trading options check out my option trading E-Book. As the May options expiration winds down, I am searching for option spreads to open for June. Normally I implement this strategy with 30-40 days until expiration as we have 36 days until expiration. This strategy has worked quite well for me over the last 3 months of using it. I use this strategy for both Puts and Calls. Below are some of my latest “half in the money” option spread strategies. I call them half in the money, because the current price of the stock is very close to being exactly in-between both option strike prices. The current bull/bear ratio is also given after each company and ticker. I use the bull/bear ratio screener to get ideas of how strong and weak specific stocks are. For a detailed list of the components in the Bull/Bear Ratio I use click here. If the bull/bear ratio is high I'll be using the call strategy, if it is low I'll be using a put strategy, if the stock is range bound I'll make my decision based on other criteria or wait until it becomes more bullish/bearish. Company (Ticker), Bull/Bear Ratio, Strategy (prices and probabilities as of pre-market Friday May 15, 2009). 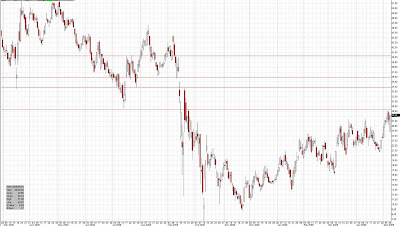 Apple (AAPL), 6:4, Buy the June 120 Call and sell the June 125 Call. Risk $2.75 per share, potential payoff if AAPL closes at expiration above $125 is $500 (net of $225 or 81%). The current options market is factoring in a 47% chance of the 125 Call option expiring in the money. Google (GOOG), 6:5, Buy the June 370 Call and sell the June 410 Call. Risk $19.80 a share, with a chance of making $4,000 (net of $2,020 or 102%) if Google closes above $410 at June expiration. This option spread needs Google to close at $389.80 come expiration to break even, everything above until $410 is profit. The current probability of this spread paying the maximum profit is 30.6%. Palm (PALM), 10:1, Buy the June 9 Call and sell them June 13 Call. Risk $180, with a chance of making $400 (net of $220 or 122%) if Palm closes above $13 at June expiration. The options market is giving this spread a 30% probability of expiring at maximum profitability. First Solar (FSLR), 8:3, Buy the June 175 Call and sell the June 185 Call. Total risk is $500 with the chance of $1000 (net of $500 or 100%) if FSLR expires at or above $185 a share come June expiration. The current probability of FSLR expiring at or above $185 is 48.7%. Goldman Sachs (GS), 9:2, Buy the June 130 Call and sell the June 140 Call (strategy not exactly in the middle GS at $133.60). Total risk is $480 with the chance of $1000 (net of $520 or 108%). The options market is currently pricing in a 38.8% chance GS will expire at or above $140 a share at June expiration. S&P SPDR (SPY), 6:4, Buy the June 87 Call and sell the June 91 Call. Risk $2.23 per share, with a potential payoff of $400 (net of $177 or 79%) if SPY closes at or above $91 on June expiration. The current probability of this position paying the maximum is 44.1%. Caterpillar (CAT), 6:5, Buy the June 34 Call and sell the June 38 Call. Total risk of $192 with a potential payoff of $400 (net of $208 or 108%) if CAT closes at or above $38 on June expiration. CAT is current .15 (15 cents) above the break even point. The options market is factoring in a 39.5% chance the CAT June 38 Call option expires in the money. Celgene (CELG), 3:7, Buy the June 45 Put and sell the June 35 Put. Risk of $450 with a chance of $1000 (net of $550 or 122%) if CELG expires at or below 35 on June expiration. The current probability this option spread will pay its maximum is 13.4%. Dryships (DRYS), 3:8, Buy the June 7.50 Put and sell the June 4 Put. Total risk of $160 per contract with a chance of $350 (net of $190 or 118%) if DRYS closes at or below $4 on June option expiration. The current probability this option spread will pay its maximum is 15.5%. Bank of America (BAC), 7:4, Buy the June 10 Call and sell the June 12 Call. Total risk of $1.00 per share with a potential payoff of $2.00 a share (net of $1 per share or 100%) if BAC closes at or above $12 on June expiration. The current probability BAC will close at or above $12 by June expiration is 54.9% according to the options market. Ford (F), 6:4, Buy the June 4 Call and sell the June 6 Call. The total risk of opening this position is $101 per contract with a potential of making $99 profit per contract or a 98% return if Ford closes at or above $6 on June expiration. The current options market is factoring in a 39.7% chance Ford will close at or above $6 on June expiration. Note that any of these spreads can be traded before expiration to capture a gain. If you'd like to learn more about options trading, check out my option trading E-Book. The options market is one of many ways to get an idea of where an individual security may be at a set point in time. The way you can find this probability is the calculated Delta value. With Chrysler filing bankruptcy, and recent news breaking that General Motors (GM) and the UAW are nearing a crucial deal, I thought it would be interesting to see what the options market is factoring in. I observed the probabilities for GM's stock price to close at or above $1.00 and $2.00 per share, for the following options expiration dates. For more information on options trading click here. As of Thursdays close GM's stock was valued at $1.15 a share. The current options market is factoring in a very high probability of bankruptcy in GM's future, as reasons may be obvious. Someone could open an option contract to own the rights on GM's stock at $2.50 a share until January 2011 for $20 per contract (20 cents a share premium). Perhaps my most interesting find is the probability that GM's stock will close at or above $2 a share for May is 4.1%, which may seem very odd as GM would have to shoot up by nearly 74% from Thursday's close. The 30 day historical implied volatility is extremely high which explains this probability. Similarly for Ford (F) we can analyze the probabilities for the stock to close at or above the nearest current value ($5.16) and double that. I find it interesting that the options market is factoring in a 49% chance that F will close at or above $10 on the expiration in January 2011, when Ford's stock has not been at or above $10 since mid 2005. Derivative markets are useful to get an idea, but change day to day. No investment or trading strategies should be formed based on options probabilities. As of pre-market Friday May 15, 2009 these are the probabilities of these two auto dealers... Time will tell what the outcome of these companies and their share prices will be. Although the market is a bit more stable today than in previous months, according to the VIX (volatility index) which is down over 50% from its 52 week high set in October, it is still at historic highs. With volatility at these levels there is no doubt it is still a trader's market. 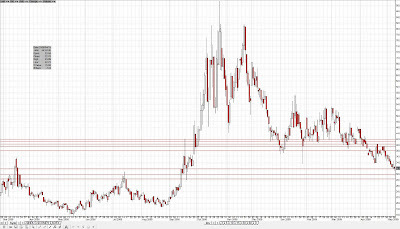 Below is a weekly chart of the VIX. As you can see every time the VIX went above 30 it never stayed above 30 too long, until the most recent time (September 2008) we have been above 30 ever since (it has traded below 30 intraday but never closed at or below 30). One way I have been able to profit from the volatility over the past 7 months is by using the option straddle strategy. As you'll see from the strategies below, the more volatile the underlying stock the higher the premium, this should make sense, and if it doesn't, this type of trading is most likely not for you. When I straddle a stock I like to go 30-40 days out until expiration. Below are some option straddle strategies I’ve used, or am currently using. You'll need to adjust strike price and expiration date based on your opinion(s) (Option prices are as of market close May 13, 2009). Strategy 1) Buy Apple June 120 call & Apple June 120 put. This strategy would cost roughly $1,300 and in order to make money Apple (AAPL) needs to be above $133 or below $107 a share come June expiration. A change of +/- 11%. Strategy 2) Buy Google June 390 call & Google June 390 put. To use this strategy would cost roughly $3,500 and break even is Google (GOOG) above $425 or below$355 a share at June option expiration. A change of +/- 9%. Strategy 3) Buy Ford June 5 call & Ford June 5 put. To use this strategy would cost $130 per option contract, but given the current state of the auto industry Ford (F)+/- 26% by June seems feasible. Strategy 4) Buy Research in Motion June 70 call & Research in Motion June 70 put. This would cost roughly $1,200 to use and would pay off if Research in Motion (RIMM) closed at June expiration above $82 or below $58 a share. A change of +/-18%. Strategy 4) Buy American Express June 24 call & American Express June 24 put. To implement this strategy would cost roughly $460 and with financials trading +/- 10% on any given day American Express (AXP) above $28.60 or below $19.40 a share in 38 days doesn't seem impossible. AXP would have to change at least +/- 20% to profit from this strategy. Similar strategies could also be used with many other volatile financial stocks or ETF’s. Strategy 5) Buy First Solar June 175 call & First Solar June 175 put. To open this position would cost roughly $3,000. First Solar (FSLR) would need to trade above $205 a share or below $145 a share to make money from this position at time of expiration. A change of +/-18%. Strategy 6) Although I do not like trading leveraged ETF’s here is an example of opening a straddle position on the SDS (Ultrashort S&P 500). Buy SDS June 61 call & SDS June 61 put. This strategy would cost $970 to open, and in order to profit from it the SDS would need to change +/- 16% by June expiration. Let's face it: Google owns the internet search space. How many times have you heard people say "Yahoo it" or "MSN it" ? Well if you have it probably isn't too often. I often find myself saying "Google it" when referring to searching the web. Google has held up well through this economic downturn, and I believe as the economy gets healthier, bids for clicks will increase, and as a result Google's share price should as well. However clicks are not the only way Google generates money anymore. The growth of Google Checkout is also generating a steady stream of income (a good example of Economies of Scope). Recently an analyst upgraded the price target on GOOG to $600 a share, with some analysts even claiming it to be as high as $750 in 1 year. A recent article states that Google's Android mobile OS is expected to grow at 900% in 2009 beating expected growth for both Apple and Blackberry. In my opinion Google is a solid company going forward; they were able to add $2 billion in cash over the last quarter which is a big plus, especially in this economy. There are several other factors why I think Google is a great company, but this is not the intention of this article. So on with the strategy: a Google bull call spread: (prices as of close Tuesday May 12, 2009- prices should be adjusted daily). I checked both the Google Leap 10 and 11 call options. I believe $600 is a feasible share price for Google in 18 months so I'll use that as my upper limit for the leap 11, and I'll use $530 for the upper limit for the Leap 10. Strategy # 1: Buy the GOOG Leap 10 $400 Call and sell the Leap 10 $530 Call. To open this strategy would cost roughly $3,400. However if Google is above $530 come January 2010 expiration this strategy would net a profit of $9,600 or 282% gain. To break even Google would need to be at $434 come January expiration. Strategy #2: Buy the GOOG Leap 11 $400 Call and sell the Leap 11 $600 Call. To open this strategy it would cost roughly $6,000, and this strategy would net a profit of $14,000 or 333% if Google closed above $600 at expiration in January 2011. I have implemented the first part of strategy two. However, I am bullish on Google; therefore, I'd like to complete the call spread at a later date, when Google is 10%-15% higher. After all, I do have over 600 days to sell the call. According to the current Delta value if GOOG were 10%-15% higher, it would yield an additional $9 to $13 for the $600 contract. As GOOG's share price increases, so will the Delta value (assuming Google to increase sooner rather than later), therefore the premium on the $600 call would be even higher than the calculated value. For strategy 1: for every spread position opened I would have 8.5 shares of Google (let's call it 9.) If Google gets to $530 I would have made a profit of $1,170 or 34.4%. Google needs to get to $438 in order for this spread strategy to make $58 more than owning 9 shares of Google common stock. For strategy 2: for every spread position opened I would have 15 shares of Google. If Google gets to $600 I would have made a profit of $3,000 or 50%. Google needs to get to $471 in order to make $35 more than owning 15 shares of Google's common stock. However, in both cases Google would need to go to $0 a share in order to lose the same amount of money from the common shares as if the option expires dead (less than $400 at expiration). With the amount of money being printed today, I think we'll see rapid inflation within 18 months. The Fed has stated they'll fight inflation by raising interest rates once they believe inflation is a threat. But how healthy will the economy be when inflation becomes a threat, and will it be safe to hike interest rates? A sure way to hedge against inflation is gold. But who wants to commit too much money to gold, with fears of deflation looming as well? I think the best way to hedge against inflation is to play an option call spread. This gives me little downside risk, with a potential big upside. There are many ETFs to look at, the most common is the GLD which seeks to track gold’s performance. Another is the UGL which seeks to track gold 2X, (double leveraged ETFs are dangerous as it is a double leveraged ETF; read more about Double leveraged ETFs here). I assume gold to be as high as $1500 within 18 months so my time frame will be playing the Leap 11 option contracts. You'll want to adjust strike prices and option expiration's according to where you think gold is going and when. 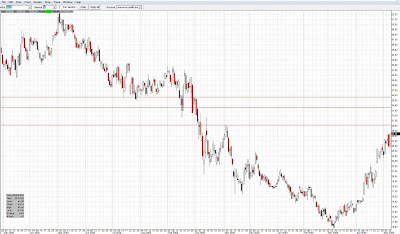 Strategy #1: Buy the GLD Leap 11 $110 Call and sell the GLD Leap 11 $140 Call. To open this strategy it would cost about $370 a contract, with the potential of netting $2,630 or over 700% assuming GLD expires at or above $140 a share in January 2011. The break even point on this is the GLD at $113.70. Strategy #2: Buy the GLD Leap 11 $100 Call and sell the GLD Leap 11 $130 Call. To open this strategy it would cost about $530 a contract, and if GLD expires at or above $130 come January 2011 expiration, the profit on this strategy would net $2,470 or 466%. The break even point is $105.30 for the GLD at Jan 11 expiration. For the UGL it is hard to predict where it'll be in 18 months; therefore, I have not been able to come up with a good strategy on it. If you're bearish on gold and think we'll enter a deflationary spiral, you may want to implement the same type of strategy only with a bear put spread. I have not opened any of these positions yet, but I intend to within the next 3 months. I am anticipating gold to pull back slightly on deflationary fears, so if and when that happens, that is when I'll jump in. In my opinion, I think we could see gold near 850 an ounce before it really takes off past 1000. I think having some gold is a critical hedge for your portfolio, and playing the option spread is a cheap way to do so. As stated before you'll likely need to adjust strike price and expiration, based on your opinion of gold. Want to buy financials, but don’t dare due to fears of a company filing bankruptcy, getting nationalized, etc...? Want to short financials, but find yourself afraid that the market will rally? Well, a strategy that has made me "bank" is playing the spread on ETFs. I don't recommend playing leveraged ETFs for the long run, but looking up to 3 months ahead, and depending on the downside risk, I may take the risk. As I'm sure we'll create a hindsight bias in the months to come, (forward speaking) many individual bank stocks would have been good buys and many would have been bad buys. It’s just too bad we don’t have a crystal ball to tell us which ones to buy/sell now. The best way I know of to have a chance at big gains with limited losses is outlined below. There are two strategies: both a Bear Put Spread and a Bull Call Spread. Depending on where you think the ETF will be (in terms of dollars) and time frame, you may need to adjust expiration and strike prices accordingly. (All prices based on close price Tuesday May 12, 2009). Spread Strategy # 1: Buy the XLF June $12 Call and sell the XLF June $14 Call. This strategy would cost $65 per contract to open, and if XLF can close above $14 at June expiration the profit from this strategy would be $135 or 208%. Break even point is the XLF at $12.65 come June options expiration. Spread Strategy #2: Buy the UYG June $4 Call and sell the June UYG $5 Call. I opened this position on Tuesday May 11 for $40 per contract, but with some hard bargaining I think it could be opened for $30-$35 per contract. If UYG is above $5 come June expiration I will net $60 a contract or 150%. Break even is $4.40 per share at expiration. Spread Strategy #3: Buy the FAS June $11 Call and sell the June $15 Call. This could be opened for roughly $100 per contract and has a potential of netting $300 if FAS closes above $15 come June expiration. The net profit in this case would be $300 or 300%. Break even is FAS at $12. Spread Strategy #4: Buy the FAZ June $4 Put and sell the FAZ June $3 Put. This strategy can be opened for roughly $20 per contract and if FAZ closes below $3 at June expiration it will yield $80 profit or 400%. Break even is FAZ at $3.80. Spread Strategy #1: Buy the XLF June $12 Put and sell the June $10 Put. This would cost roughly $60 per contract to open, and if XLF is below $10 come June expiration the net profit would be $140 per contract or 233%. 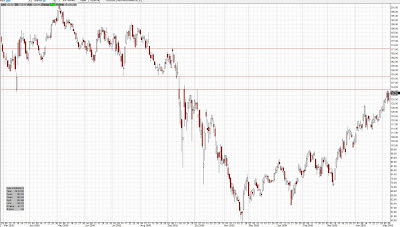 In order to break even on this play the XLF will need to be at $11.40 come June expiration. Spread Strategy #2: Buy the UYG June $4 Put and sell the June $3 Put. To open this would cost roughly $30 per contract, and if UYG expires in June below $3 per share you’ll net $70 or a gain of 233%. 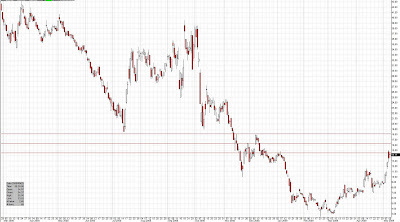 Break even would be UYG at $3.70 at June expiration. Spread Strategy #3: Buy the FAS June $9 and sell the June $5. This position could be opened for roughly $125, but I give it a larger spread due to the volatility on this (dangerous in my opinion) ETF. If FAS ends up below $5 at June expiration this strategy would have netted a $275 profit or 220%. Break even would be at $9.25. Spread Strategy #4: Buy the SKF June $45 Call and sell the June $52 Call. This position could be opened for roughly $200 per contract and if SKF expires in June above $52 this strategy would net a profit of $500 or 250%. In order to break even SKF would need to be at $47 come June expiration. I found the best strategy to be the single ETF or the XLF. Depending on how long you wait to implement these strategies will make a big difference, and each strategy should be fully analyzed before opening any of these spreads. Despite Monday's stock market sell-off it looks as if crude oil hung in there quite well. Crude closed Monday at $58 and change. Big oil names such as Chevron (CVX), Exxon (XOM), ConocoPhillips (COP), Frontline (FRO), Nordic American Tanker (NAT), and Valero (VLO) sold off far worse than crude oil. The overall market and crude have traded similarly over the last month as the Google chart shows below. Crude may be recovering due to speculation that the economy is getting better, or possibly due to fears of inflation and a weak dollar. Whatever the reason, crude is trending up. I certainly don't think we'll see $140 crude but I believe $70-$80 crude isn't out of the picture by peak driving season. The current Bull to Bear Ratio (as defined here) on the USO is 9:2 is up from 8:3 last week. I have two Gas Guzzling SUVs, therefore I like to hedge myself whenever possible. A way to hedge my expensive driving habit, is to profit off of crude oil increasing. Since I am speculating, I like to play vertical call option spreads, ones with big upside and minimal downside. Some option spreads I am playing with involve two crude oil ETFs, the USO and the UCO (double leveraged crude oil ETF - dangerous!). As we can see from last season, Crude peaked in July, therefore I speculated with the option contracts for the July expiration. Yesterday I bought the July 35 USO contract and sold the July 40 USO contract for a difference of $90 per contract. If the USO gets above $40 by July's option expiration I will make $410 per contract ($500-$90). Since my cost is only $90 per contract, In order to break even I need the USO to get to $35.90. I believe this is feasible, as it is less than 12% higher. The other call spread I opened yesterday was for the UCO. I bought the July 11 for $85 per contract and sold the July 15 for $30. The downside involved in this contract is $55 per contract with an opportunity to get $400 per contract (net of $345 or 600%+). There are many other crude ETFs that are plenty volatile to fetch nice option premiums on, these are just two. I used this strategy last summer as the price of crude kept rising, and it paid off BIG! On Monday I bought 25,000 shares of SIRI and wrote out the September $1 for $10 per contract (10 cents a share). My cost per share is 31 cents. Siri is about 35% off of its high reached about 2 weeks ago. I didn't go to Vegas with my friends last weekend, so I figured this was my gamble for the year. My reason for speculating with Sirius is I believe it may be ready to breakout again, as it looks like there is a falling wedge forming. As you can see major resistance comes in at around 38 cents, therefore I believe we'll get to 38 cents before we break out again. If you can see from the first falling wedge, SIRI was setting lower lows and lower highs, forming a falling wedge (a bullish pattern). However SIRI held above 38 cents for almost a week before it broke out. If SIRI breaks below 38 cents (and stays below) I would take it as a bearish sign. 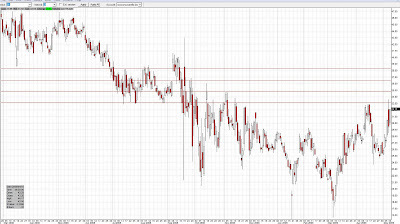 However if it can hold resistance at 38 cents I think it is due for another breakout. The overall picture on SIRI is bearish, including the MACD and very light up volume. SIRI does not have significant short interest, therefore if the uptick rule is reinstated anytime soon it will not help too much. I guess time will tell how SIRI will hold up at $.38. Does Palm's Pre Have Anytihng on the iPhone or Storm? 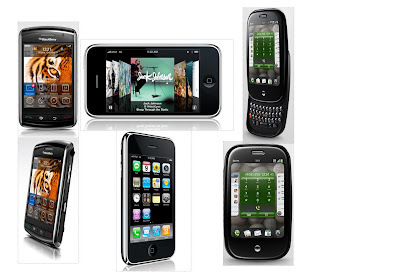 With the release of the Palm Pre on the horizon, heavy questions are being asked if it will have any effect on Apple (AAPL) iPhone or the BlackBerry (RIMM) Storm Sales? The most likely answer is no, because the Pre is exclusively for Sprint (S) in the U.S. for the time being, Storm for Verizon (VZ), and the iPhone is exclusively for AT&T (T). But what if the Palm Pre gets better than expected reviews and becomes "celebrity status"? Will it be able to steal the iPhone and Storm's thunder? Let's face it (and I am sure I will get some heat for this one), Apple sells a trend. The birth of the iPod was Apple's second coming. 100% credit given to Apple as I doubt the "i" craze could have been done better by any company. The iPod has also spurred Mac sales, which is helping Apple take market share away from Microsoft (MSFT). Anyway back to celebrity status... What if the Paris Hiltons of the world suddenly had a Palm Pre instead of the iPhone, would it be able to gain market share better than people expect? My answer to this is yes, I believe if celebrities are caught on camera, making fools of themselves with the Pre in hand, it could increase the demand tremendously for the device. This is what Palm needs to sell in order to survive, a trend! In my opinion, my Palm Treo 650 from 2005 is a better phone than the BlackBerry Storm, but the iPhone will be hard to beat. I think if the Pre turns out to be a good device and "bug-free", it will give the iPhone a run for its money. The Pre is expected to debut in June sometime, with a huge following. Palm is putting everything into this phone, and if it fails, the company will most likely be filing bankruptcy faster than Enron did, after it was figured out. If the Pre does better than expected, I believe it is just the beginning of a successful road for the company, as more phones will be released with Palm's new webOS. If the Pre does better than expected, depending on which carriers will get the phone, it will most likely send Sprint higher as well. I know quite a few people who kicked Verizon to the curb, in order to get the iPhone... So it is possible the same thing may happen depending on how hot the Pre is and how long it is exclusively for Sprint. If the Pre is a hot phone as all the reviews (especially CES) show, Palm stock should be a buy. I am a little concerned Palm's stock will sell off a bit on the news (once it is released or date and price info is provided), but once results are released on how the Pre is doing, and if they are good, Palm should be able to rally on that news. I found it hard not to ride the Palm bandwagon. 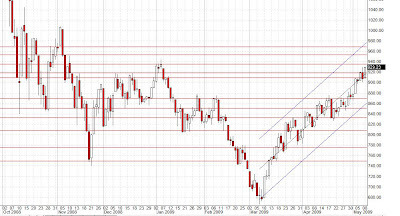 Looking at the chart for the S&P 500, it looks as if we broke through critical resistance on Friday at 920. It is important to stay above 920 for the market to go higher. As of Friday's close at 929.23 it is crucial that we stay above 920 on the S&P to go higher. If we break below 920 next support comes in at 910 and if we didn't hold above that, next support minor support is at 900. Major support level is about 870 and the lower trend regression line comes in at about 860, so if we break below 860 it is an extremely bearish signal. The next minor resistance comes in at around 935 and if we break through that the S&P could potentially get to 955 on a short-term basis. The higher trend regression line comes in at about 980, so anything above 980 is a very bullish signal short-term. So what does the options market factor in the market doing by June expiration? I will pick the closest strike price to 10% above the current price for the June options expiration, and state the probability the options market is factoring in for that strike price. I will analyze the options on the S&P 500 index, as well as the S&P 500 SPDR (SPY). I will also analyze major components that I blog abou frequently such as: Exxon Mobile (XOM), Visa (V) (soon to be in S&P 500), Caterpillar (CAT), Amazon (AMZN), American Express (AXP), Goldman Sachs (GS), Bank of America (BAC), Boeing (BA), McDonald's (MCD), Pfizer (PFE), Coca Cola (KO), AT&T (T), Kraft (KFT), General Motors (GM), Merck (MRK), International Business Machines (IBM), Apple (AAPL), Yahoo (YHOO), Google (GOOG), and Research in Motion (RIMM) (sorry for the order I just typed them as I thought of them). You'll notice that the more volatile stocks have higher probabilities of getting to the 10% strike price which should make sense. You'll also notice that a higher implied volatility will bring higher premiums to the option contract, for a list of great covered call strategies check out my blog. However To get a better idea we should look at the index option or the SPY. This gives a 14.1% and 14.7% chance of the S&P 500 index and the ETF which tracks the S&P 500 index respectively. The puts on the S&P 500 index give a 13.3% chance the index gets to 840 by June expiration, and the SPY has a 17.9% chance of getting to 84. Looking at the chart for the VIX it looks as if we'll have a chance to get below 32 which is a critical support if this market can become more stable. 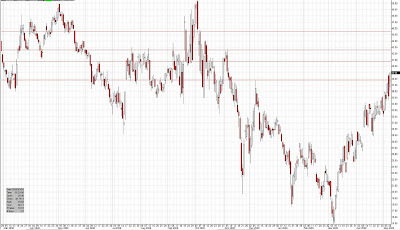 If the VIX breaks below 32, we could see it move down to 30. Historically the VIX above 30 is extremely volatile, so if we could get the VIX below 30 in the next weeks to come would be a good sign of stabilization. The VIX has not closed below 30, since mid-September when it seemed like banks were failing and getting nationalized every weekend. 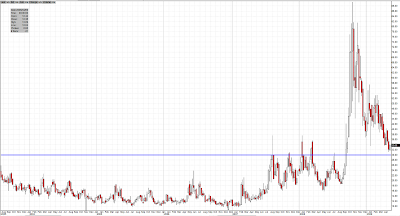 The VIX below 30 would be a great indicator of stabilization, and the market could possible rally on that news. Could this create a self fulfilling prophecy in itself? I doubt it, but it would certainly be nice for the bulls. The options market is factoring in a 66% chance the VIX will get to the 30 strike by June expiration. The options expiration for June is the 20, which means the last day for trading any of the underlying stocks/index is June 19. 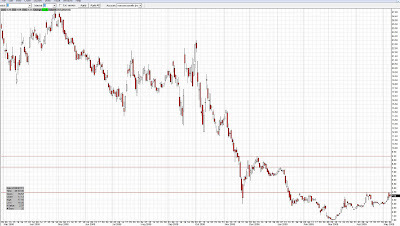 However the the VIX contract expires on the 17 of June. I have learned that options are a good indicator of how the market will play out in the weeks to come, but of course we can't depend 100% on what they predict. I guess time will tell what these stocks will be at come June expiration. Here is a list of stocks I’ll be keeping my eye on for the week of May 11, 2009. These stocks are all considered to be Breakout Bulls. These are the current highest bull/bear rated stocks my screener has returned. To get a detailed definition of the bull/bear components check my Bull/Bear Ratio Defined post under Hottest Blog Posts. I would use extreme caution if planning to purchase any of these stocks and would do some extensive research before buying any of them. These will certainly be on my watch list the next few trading days. I'll wait for a 7-10% pull back to purchase any of them and set a tight stop loss if I happen to purchase any of them. If I purchase any of them, I will be selling into strength. Note that when Ratios are in gold that it means the stock is Range Bound, and when they are green it means they are trending up. To learn more about the Bull/Bear Ratio click here. ***Note*** The net debit is the price the underlying stock must be at in order to break even from buying the stock and writing the covered call. Most brokerages allow you to put a limit order in by this method. Example: If Apple is at $129.00 and the contract bid price for the June 130 is 6.50 you can sell it immediately by buying 100 shares at $129 and selling the call for $6.50 creating a net debit of $122.50. I tend to set the net debit price a bit lower to get the best possible deal. As for the Apple power play below I would set the limit at $122.10 the difference of the two must be $122.10 in order to buy the shares and sell the call. Use extreme caution when utilizing these buy/write strategies as the net debit should be adjusted daily with the price of the stock. The stress test results came out after hours Thursday May 7 and bank stocks were immediately off to the races. The Fed is expecting the combined 19 banks will lose close to $600 Billion next year, and 10 of the nation's largest banks need to raise about $75 Billion in more capital. Many people think the banks are overvalued as they've had amazing runs in the last 8 weeks, others think they're still undervalued. The charts from 8 of these financial institutions are below, and major resistance and supports are labeled. In a nutshell these charts show that these banks can continue to run (at these % increases) with the help of the overall market. If you hold any of these stocks and are thinking about lightening up, but don't know a good price point, these charts may help. If you are stuck between being bullish and bearish you may find some of the covered call option strategies on my blog to be useful. The top 5 banks out of the 19 which need the most capital from greatest to least are: Bank of America (BAC) $33.9 Billion, Wells Fargo (WFC) $13.7 Billion, GMAC (GMA) $11.5 Billion, Citigroup (C) $5.5 Billion, and Regions Financial (RF) $2.5 Billion. AXP is currently in between its support and resistance, and with an up market should easily get to (if not break through) resistance at $30. 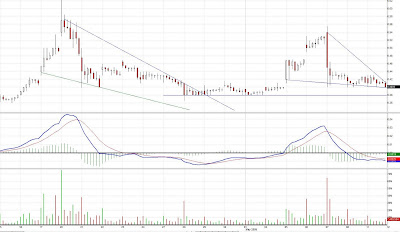 If it breaks through $30 a share it could easily get to $34, and ultimately $36 short term. This is a very bullish chart, especially being in the middle of support and resistance, my guess it it will certainly get above $30 with the help of the market! Although Visa (V) and Mastercard (MA) are not exactly the same type of business as American Express, look for them to do well if AXP does. BAC broke above resistance and if it can hold, it should be able to get to the next resisatnce fairly easy. Next resistance for BAC comes in at $16 and then $18. If it breaks through $16, watch it closely as it may come back down quickly, if it bounces off support at $16 once through it is a very good sign, and could easily get to $18 short term. BK has a very choppy chart (in terms of testing resistance/support). BK tested its short term resistance Thursday creating what looks to be a double top, before sliding back down and closing lower. 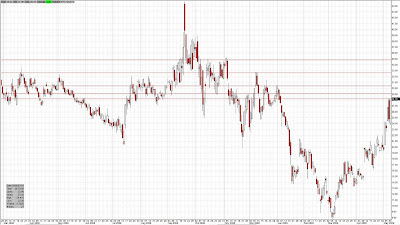 BK could potentially rally up to the $38 range but first must get through resistance at $35, then $36.50. C closed above $4 Friday, which is in critical range. As you can see from the chart it has tried to break above it several times- I can count 5. However investors are still uncertain if the government will convert their preferred stock into common staking almost 50% in the company. However the faster they fall the faster they rise, and Citi could potentially get to $7.50 before running into any resistance at all, then $9, and then even $14.50 before it settles down. Watch for C to run if it can get and hold above $4.50. However Citi getting that hot is very unlikely as stated. GS is a chart I like to see (especially as a shareholder). GS looks as if only two resistance points are in its way of getting back to $170 a share. The two come in at $140 and $151. If GS breaks through $140 anytime soon look for a quick rally to $151, and then if it can fill that gap up at $151 and break above it, watch and see how fast it can get to $170. Remember if they break through resistance, resistance now comes a support and if they break down through support they can easily get back down to where they came from. JPM broke and closed above its resistance Friday. This is an extremely bullish sign, as it is through $36, it could easily get to $41 (there are a lot of minor resistance levels it may need to clear in between) and potentially to $42, before it could get above $45 a share (once again a lot of minor resistance levels in between the 42-45 range as well). JPM has a lot of minor and major resistance as it is said for be one of the stronger banks, and did not experience the downside many of the other financials did. MS looks as if it tried getting to its resistance around $29.50 Friday which is a bullish sign if the uptrend can continue. A rather sloppy chart, MS looks like if it could clear $30 and fill the gap to $32, it could easily get to $34, if it fills the next gap and gets to $36 MS could be smooth sailing until $40 a share. WFC actually closed at its resistance which tends to be a bullish sign. WFC will need to clear $28.18 a share. If WFC can get above $28.18 a share, it could easily get to $29 before testing resistance at $31.25, then $32.50, and then $34.50. However there are plenty of minor resistance points between $31.25 and $34.50, which could make it tough for MS to achieve any of these higher levels. I will be taking some profit, not by selling the stocks, but writing some covered calls on them possibly as much as 10% in the money. Some advice would be to take some profits if you're up, as any of these charts should be clear to you that the gains in the last month alone cannot keep going like this, and should be trimmed. However there is still a lot of money on the sidelines which could keep this rally going!